Getting a good IT job for freshers in this tough job market is really a big deal today. Let’s see how Karthik managed to kick-start her career in the IT industry straight out of college. 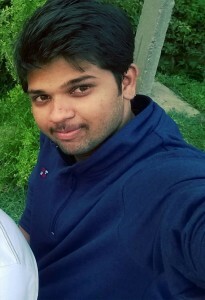 Karthik: My name is Karthik Sharma and I pursued my engineering in Computer Science discipline. My career goal is to get placed in a good IT company with a decent package and where I can get “ALWAYS LEARNING” environment. 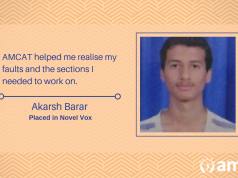 Karthik: I belong to the college where campus placements are very less and when I tried attending off campus drives there was a cut throat competition. Aspiring Minds: Tell us about your experience post giving the AMCAT test and how AMCAT helped you in getting the job at GGk Technologies (Campus)? 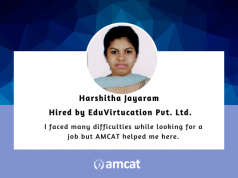 Karthik: AMCAT is amazing. I got five to six interview calls after taking AMCAT from different locations and the exams conducted for those respective jobs were challenging as well. GGK Technologies was one among them. GGk Technologies interview had 4 rounds and I cracked every round with confidence. 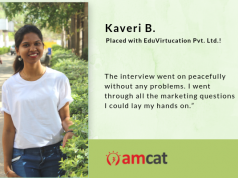 Karthik: Yes, I would sincerely suggest job seekers to take AMCAT as it provides you an opportunity to showcase your abilities and talent. Karthik: Concentrate on the core subjects and practice Quant and reasoning for the aptitude. Also try to pursue online course. You can learn things with ease. All the best. Next articleStruggling to find a job in this challenging market? Register for the AMCAT Telangana Online Job Fair 2016 today! Job offers are also dependent on how good your AMCAT scores have been. We recommend you to go through your report again and work on suggested improvement areas. Meanwhile, you have been added to our pool of freshers available for work and your details have been shared with the companies that we work with. The calls begin on the basis of fitment.